Rough Justice is a novella revolving around Olivia’s first Hunt as Matilda for the Cwn Annwn. The Hunt provides justice to those who have killed descendents of the fair folk and the Matilda leads that hunt as witness when justice is served. Olivia’s day job is as an investigator for her boyfriend lawyer Gabriel, so admittedly it’s hard for her to accept their prey’s guilt without proof, and because of that he goes free. Olivia investigates the murder and finds that the solution is not as clear cut as portrayed. 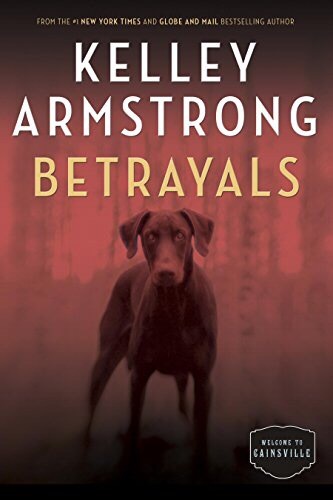 Kelley Armstrong has written another great novel in this series giving us just a taste of being back with our favorite characters. The mystery traversed a path that was unexpected and I enjoyed that journey, however the tension that filled the other novels was missing from this one with only a mild segue into the current status of Gabriel and Olivia’s relationship. Maybe I’m nitpicking but that tension was a big part of why I felt the series was so gripping. If you need a Cainsville fix this novella will give you one, but I hope she is writing another one quickly because this is just an appetizer and not a whole meal. I received a copy of this novella through NetGalley for my honest review and it was honest. This second novel in the Casey Duncan series is even more addictive than the first. A Darkness Absolute melds mystery with the paranormal. Even though there aren’t any vampires or werewolves, Rockton is filled with boogeymen. Casey, settled into her role of Detective and happy in her new relationship with Eric Dalton is blindsided when she and another officer on the force find a woman who had been held captive in a cave for over a year. To top it off, she was a resident of Rockton that they had believed perished in the woods. It’s Casey’s job to find out whether the kidnapper was a resident of Rockton or one of the settlers in the surrounding land. 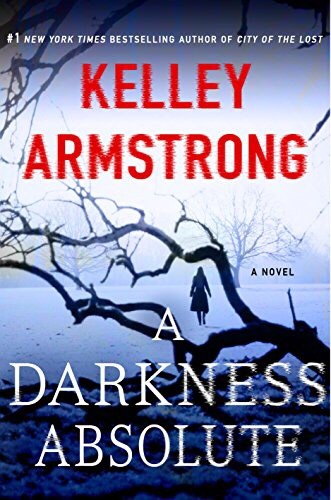 Kelley Armstrong has a deft hand at pretty much any genre, but I am discovering that I love her rather creepy mystery novels. The fact that Rockton is a town filled with people who are running away from something, either as victims or as the perpetrators of a crime, is the perfect premise for the macabre. Even the people who are friendly need to be looked at, since everyone’s past casts a dim light on their character. Casey and Eric’s relationship takes a step to the next level with Eric showing signs of possessiveness and insecurity. It’s nice to see the male in a relationship really caring about the outcome of his actions. I’m digging these two as a couple! 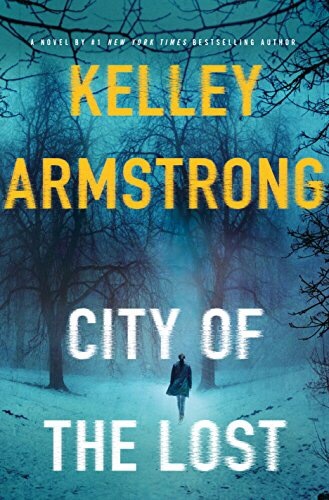 Kelley Armstrong’s novels center around a mystery but usually take place in an Urban Fantasy setting. City of the Lost also has a mystery as the center of its story, but seems to be pretty straightforward without any hints of a fantasy world. However, the city Casey Duncan and her friend move to to escape their pasts sounds too good to be true. A city filled with other people who are trying to leave their pasts behind. A city thats off the grid and where no one can find you. A city with hints of the old west, where men outnumber the women and is policed by a sheriff, the favorite hangout is a saloon/brothel, and hints of danger in the forest that surrounds them. City of the Lost is a mystery with hints of horror, typically not my thing, but I loved it. Casey Duncan, our heroine, was allowed to live in Rockton because of her skills as a detective. Someone has started murdering the citizens of Rockton. When Casey arrives, she butts heads with the sheriff who has absolute rule, but soon learns how to work with him. Is there eventually an attraction between them? Yes, and it’s filled with emotional upheaval, passion, and grit, however, this is not a love story, though that bit was really enjoyable. This is a mystery and it’s intricately planned and the characters involved were fascinating. Imagine living in a city where every person there is escaping something. They could be victims, but they also may be the perpetrators of horrible crimes, yet no one knows each others past. Its a fresh slate, but sometimes a persons nature just can’t be changed. When Ricky gets implicated in a crime where someone is killing young women, Olivia starts to investigate. The crimes are tied to she, Gabriel, and Ricky’s relationship to the Cwyn Anwyn and the Fae. Each wanting her paired up with one of the men. During their investigation Olivia uncovers more secrets about her past and becomes more torn between her love for both of them. I love how her relationships with both Ricky and Gabriel have evolved in this series. Ricky, as her boyfriend has her best interests at heart and seems to act very unselfishly, at times unrealistically. However, my own fascination with Gabriel, and Olivia’s new focus on him as more than a friend, allows me to overlook Ricky’s choices. I like Ricky and if this were a movie I’d be drooling over his good looks, but give me the strong and tortured hero, and I’ll root for him every time. Gabriel, however seems to be his own worst enemy constantly making mistakes and hurting Olivia. Will she keep giving him another chance? If this were real life, maybe not, but I’m happy she does in this series. In Omens, Olivia Taylor-Jones finds out she is adopted and discovers that her birth parents were famous serial killers. Visions starts off immediately where Omens ends. Olivia went home to her mother’s to grab some clothing and while she was there someone leaves a dead body in her car, dressed in her clothes and made up to look like her. Then the body disappears and she investigates who the dead girl is and starts to find out some rather unsettling things about her new home -the town of Cainsville. This was such a fantastic book, even better than the first which I thought would be hard to beat. Olivia’s relationship to MC club member Ricky steams up the pages, but her friendship with Gabriel intensifies in a different way. Both of these men become important to Olivia, but their relationship with Olivia becomes important to the elderly residents of Cainsville. The relationship triangle of Ricky, Olivia and Gabriel was really interesting and even though Ricky was hot and nice I still found myself wishing for a friends to lovers arc to start up between Olivia and Gabriel. Additionally, we find out some insights into the goings on in Cainsville, which at first seemed to be harmless, but as the investigation becomes more dangerous those elderly folks remind us again that appearances can be deceiving. 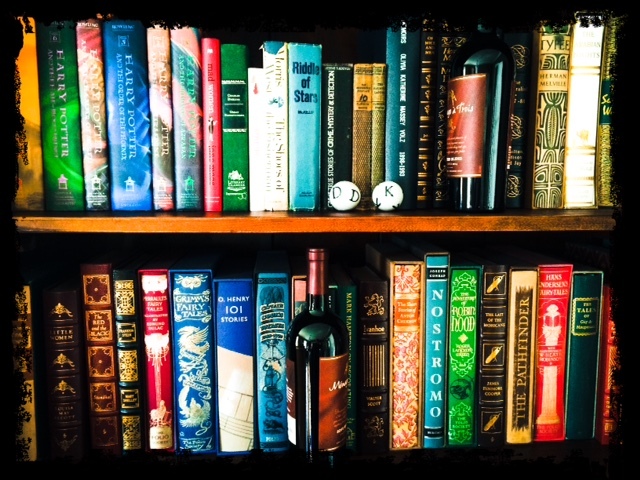 Have you ever heard the old adage of don’t judge a book by its cover? Well that saying certainly applies to why I hadn’t gobbled up this series yet. I do not like horror novels. I get scared easily, have nightmares and am basically a big chicken. The name Omens took me back to my teenage years of slumber parties and being scared to death watching Halloween and He Knows You’re Alone. Well, I couldn’t have been more wrong! 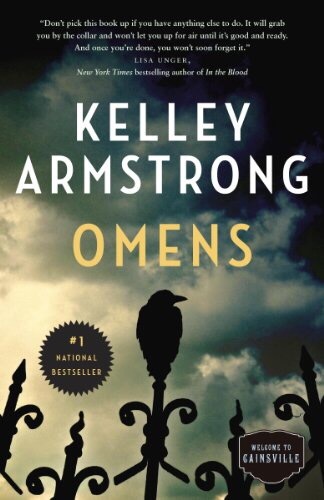 I should’ve known, I am a huge fan of Kelley Armstrongs Otherworld series and love paranormal books. This series, even though set in a town called Cainsville, is NOT like Amityville Horror! It is a fabulous paranormal mystery series whose protagonist learns a deep dark secret about herself that makes her look deeper into her kind of superficial life and make some abrupt changes. Olivia Taylor-Jones, a socialite in Chicago, finds out abruptly that she is adopted. That fact is shocking but when she finds out her birth parents were notorious serial killers her life is turned upside down. To escape the press, she runs away to a small town outside Chicago, called Cainsville. It is in Cainsville that she starts to learn about her talent for reading Omens, but when those Omens start to come true, she looks deeper into herself and her background to find out why and how. Part of that discovery is dealing face to face with her birth mother, who is in jail for committing murder on four couples in a ritualistic manner. With the help of her mothers ex lawyer, Gabriel, she starts to investigate one of the murders, the outcome of which changes the path her life had been taking. 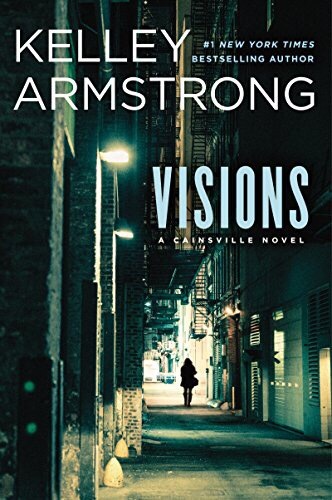 Kelley Armstrong has a talent for world building, and Cainsville and its inhabitants are a new world for me to explore. Even though this book isn’t a horror story, it does live up to its name. Omens has its creepy moments, the mystery is paranormal in nature, and the characters are not as they appear. Just the way I like it! Lucky for me, there are four books out in this series, with the fifth and last due out in August. I can’t wait to see the relationship develop between Olivia and Gabriel and learn the other secrets they unearth about themselves and Cainsville.